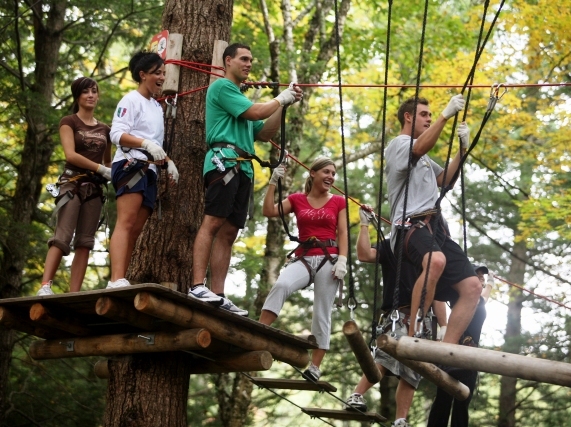 What is the Treetop Adventure Park? 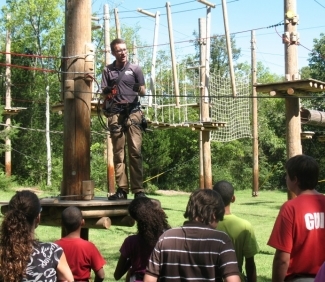 The Treetop Adventure Park is an adventurous obstacle course set in the natural environment where the course is located, in this case, the beautiful woods of Nashville Shores Lakeside Resort. The obstacles are suspended between poles and participants stay securely clipped into a red safety cable throughout the course. The obstacles you will find in our park include suspended bridges, scramble nets, swinging logs, Tarzan jumps, and much more. How far in advance should I purchase my tickets online? Online tickets MUST be purchased 24 hours in advance. Can my child come alone if they are under the age of 18? Any guest under the age of 16 will need to be accompanied by someone 18 years or older. Any adult with a minor under the age of 16 must be ready to participate with that climber. Booking in advance is STRONGLY recommended. To avoid any delays upon your arrival we highly recommend you book in advance. Contact (615) 889-7806 to book a reservation today! Please remember to arrive 30 minutes before your scheduled reservation in order to fill out waiver forms and get fitted for your equipment. Who has to fill out our waiver? Everyone that wants to experience our fun-filled courses must complete a waiver. Please note that anyone under the age of 18 must have their waiver forms completed and signed by their parent or legal guardian. Click here for the waiver form. Is there more than one circuit in TAP’s course? Yes - indeed there is! There are FOUR junior/adult courses for those who meet the height/age requirements (Green, Blue, Red and Black) and ONE children’s course (Yellow). How long, in terms of time, would it take the average adult to complete all four circuits in the Full junior/adult course? Although you can end your thrilling adventure at the end of any one of the circuits, it will take you approximately 3 - 4 hours to complete the full adult course (including the brief training session). When you have completed your waiver form and paid for your access, you’ll be scheduled into a brief group training session. 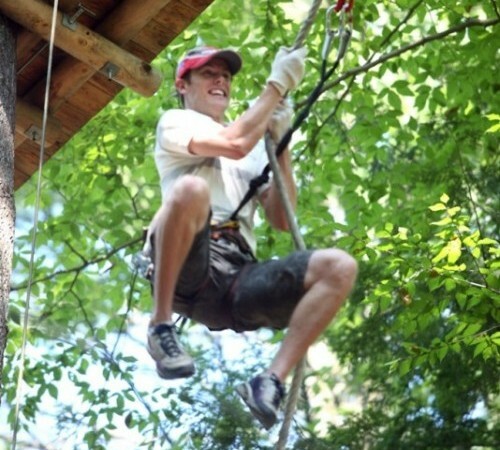 At the training session, you’ll be fitted into your harness and your guide will show you how to attach yourself to safety lines and how to attach yourself to a zip line. Once your guide deems that you can safely use your equipment, you’ll be able to proceed onto a course. Children must be a minimum of 7 years old. In order for children to be able to reach the safety lines and manage their way through the course they must be able to reach the tips of the fingers to a height of 4’7" while keeping their feet flat on the ground. An Adult must supervise the child while the child is up on the Course. Is there a height restriction for the Full junior/adult course? 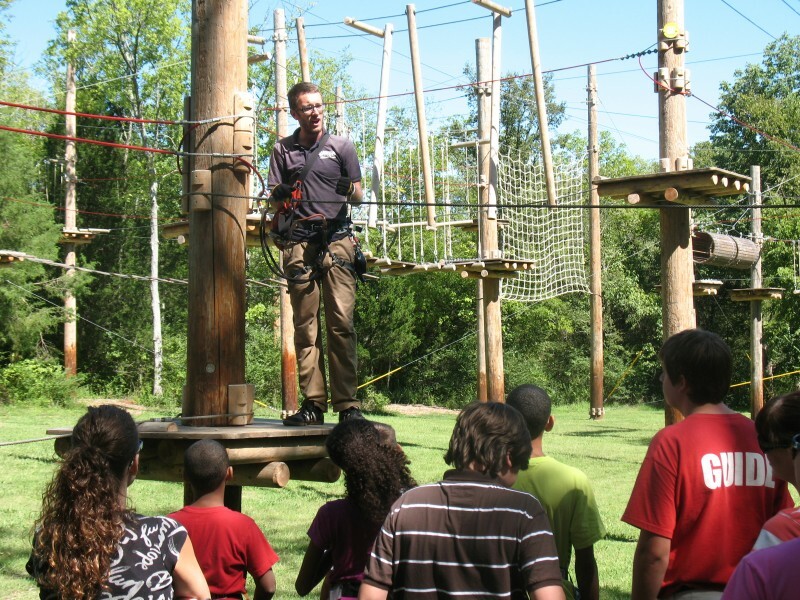 In order for guests to be able to reach the safety lines and manage their way through the Adult course they must be able to reach the tips of the fingers to a height of 5’11" while keeping their feet flat on the ground. For the Junior course, guests must be able to reach the tips of the fingers to a height of 5’9”. Our general weight limit is 275, but it's all about the harness and a proper fit. For example, a 6'5" 275lb person fits fine in a harness... but a 5'2", 275lb person probably will not. 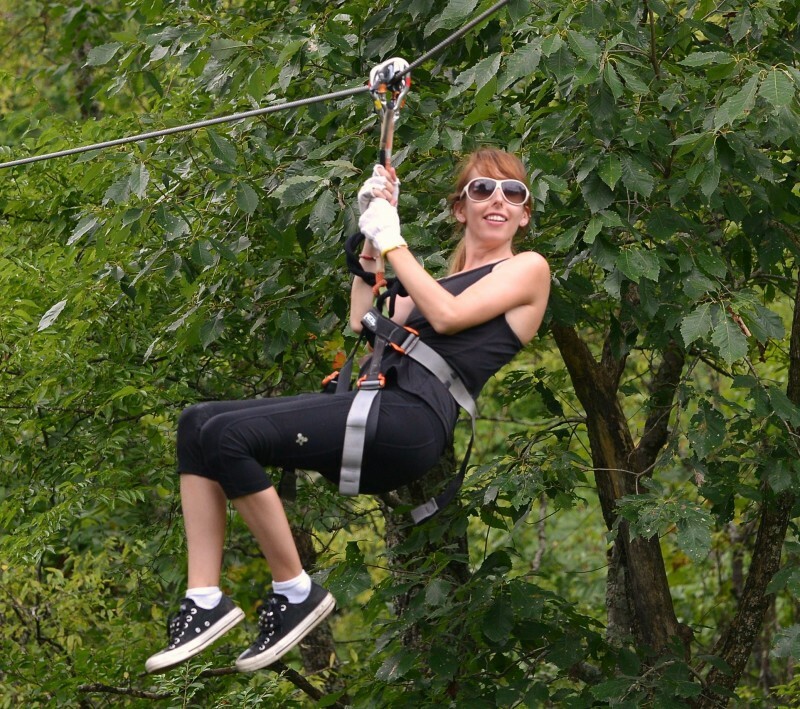 Typically a person who has a 46 inch waist or smaller can participate at Treetop Adventure Park. If you email us a height/weight combo, we can usually tell if it might be an issue. How are the four circuits in the Full junior/adult course ranked in terms of elevation and difficulty? The skill level and height of each section of the course is marked using a color-coded system indicating the challenge based on elevation and difficulty. Appropriate footwear and clothing is required for safety purposes: We recommend that you wear work-type gloves; DO NOT WEAR OPEN-TOED SHOES; no flip flops; no slip-on shoes; no loose baggy clothing or shirts wrapped around the waist; long hair must be tied back; secure eyeglasses and, we strongly recommend no jewelry - especially necklaces or loose bracelets which could get caught in equipment. As well, we recommend that you wear clothing that you don’t mind getting dirt or sap on (they’re trees, it just happens). Guests can be refused access to the course if they do not have appropriate clothing to meet our safety standards. Can I get a refund if I don’t want to proceed on to a course? If you don’t proceed onto a course immediately following the end of your training session, you are eligible for a partial refund. Once you have finished your training and you start on any of the courses, you’ll have forfeited any refund options. There are walking trails along the course that allow you to walk and observe others as they use and progress through the courses. You are not to cross under the course, or remain or loiter directly under the course for safety reasons. Is it possible for physically disabled persons to use the course?